Estartit is located in the middle of the Costa Brava, in the center of the region of Baix Emporda, and belongs to the municipality of Torroella de Montgri. Our 5 kilometer beach has fine sand and the shallow depth of the sea makes it ideal for families with children. 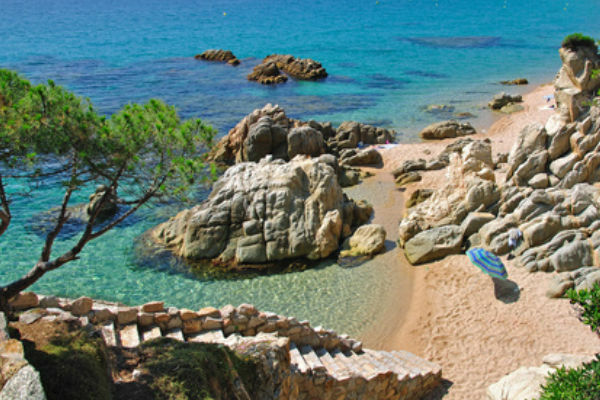 If you want to spend a day of your holiday visiting the coves that are typical of the Costa Brava ,with their rocky shores ideal for snorkeling, you also have the possibility of visiting the villages near to our apartments like Palafrugell and Begur. From the Sa Gavina Medes and Sa Gavina Gaudi apartments, you take the C-31 at Torroella de Montgri heading south, and after a drive of 20 minutes, you come to the village of Begur where you can choose between the coves of Sa Riera, Aiguafreda, Sa Tuna, Fornells, Aiguablava: these sheltered coves have clear water and rocky sand, splendid for family days out. Some of the coves are accessible by car and others require a downhill walk. Some offer services like toilets, showers, a lifeguard service. Other coves have no public service available and remain wild regarding the limitation of the surrounding buildings. Continuing along the C 31 you may deviate towards the town of Palafrugell, with the beaches of Tamariu, Llafranch, Calella de Palafrugell. These are small beaches, ideal for snorkeling, although can be very crowded during the summer months. These beaches have public services and are accessible by car. Another Costa Brava cove recommended to visit with the family, given its size and services, also it’s proximity to our apartments is Cala Montgo, situated between the municipalities of Torroella de Montgri and La Escala. From the Sa Gavina Medes and Sa Gavina Gaudi apartments, this cove reached by car in 25 minutes because although physically located a few kilometers from Estartit, it can only be accessed through a forest path of Montgri or through the neighboring town of La Escala, a distance of 20km along a tarmac road. Cala Montgri has public services, terraces and restaurants, as well as the possibility of hiring sunloungers. Do not visit Cala Montgri without taking your snorkeling gear.